What is it like to get a tattoo? Those who are not tattooed see the results of the body art on people around town but how is it actually done? A demonstration at Sarjeant on the Quay, Saturday 12 November will give the public a chance to observe the tattooing process up close when tattoo artist Nick Fletcher inks a portrait of reggae music hero Bob Marley on the calf of local boxing coach Ivan Lacy. The demonstration takes place in conjunction with photographer Richard Wotton’s exhibition, Marking Time: Portraits of the Inked. Mr Fletcher, who owns Flaming Art Tattoo Studio on Guyton Street, also features among the portraits with his girlfriend at the time. He inked her tattoos and several of Mr Lacy’s. “Ivan has an interest in reggae and has always wanted a portrait of Bob Marley. Because this exhibition is about portraits of the inked I thought it would be fitting to do a portrait tattoo. He was already booked in, so why not do it in the gallery?” Mr Fletcher says. He will give his own creative twist to the portrait, adding musical notes and other elements, but as with all of his work it will be meticulously planned and thought through. 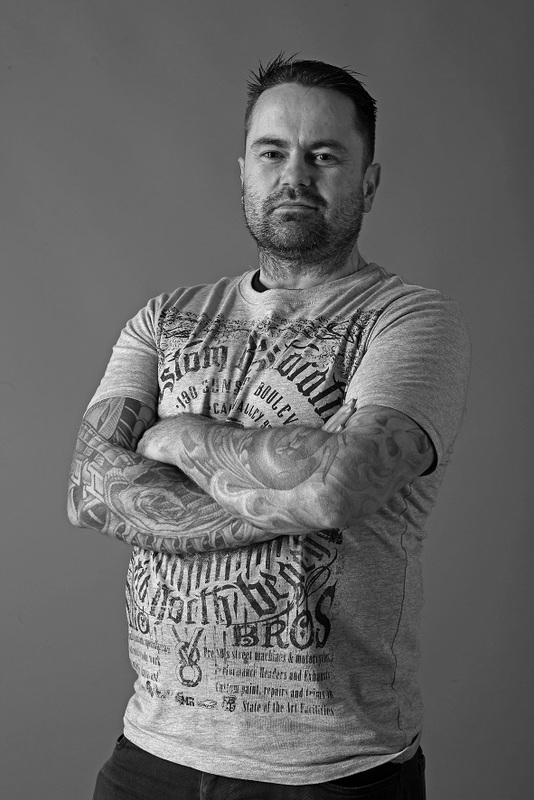 An experienced tattooist of 15 years, Mr Fletcher started out in a Skyline garage in 2001, building his skills and confidence by tattooing friends and family. He bought the equipment through a Trade and Exchange magazine (before TradeMe started) and a tattooist in Palmerston North sold him all the gear, including a sterilizer. There were no apprenticeships or people to teach him so he bought a “how to” book on tattooing and went for it. The advent of pre-made needles has made the process more efficient. Nowadays, if he has a walk-in customer the needles are ready to go. And there are many different needle cluster combinations to achieve different effects, such as shading, brush strokes and different kinds of lines. He prefers single-use needle cartridges now, which are very precise, efficient and sterile. He says the people in the exhibition represent a good range of characters and tattoos, some with old-school designs from years ago; others are younger people with more recent styles. Mr Fletcher prefers the biomechanical style which has become popular over the last 10 to 15 years and was developed by Hans Rudolf Giger, who worked in the special effects design team for the film Alien. He also likes Oriental imagery such as snakes and dragons, and has Chinese and Gothic dragon tattoos. Come along to the Sarjeant on the Quay on Saturday 12 November between 10:30am and 4:30pm to watch Nick in action. The exhibition Marking Time: Portraits of the Inked will be showing at the Sarjeant on the Quay from 5 November 2016 – 5 February 2017. This story was first published in the Wanganui Chronicle on 01 November, 2016.